Authentic Selteab Inc. Beatles dolls from 1964. 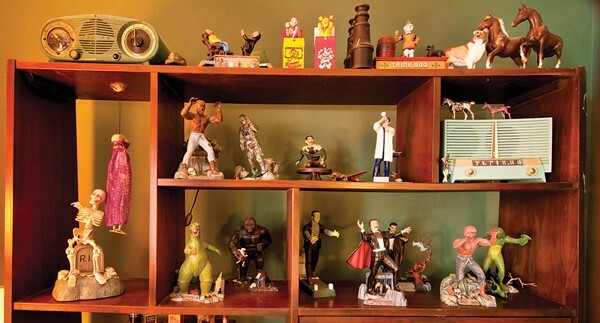 Frank Basile's lakeside house is a theater of nostalgia, with its teeming population of TV and music characters, shelves full of Looney Tunes glasses and other cartoonware, the working jukeboxes, games and toys, and piles of brown paper-sleeved 45s. 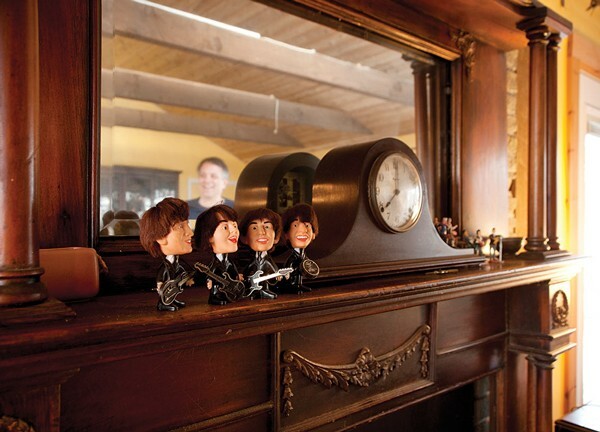 A diminutive John, Paul, George and Ringo, complete with synthetic mop tops, boogie on the Victorian mantle, while the pair of John F. Kennedy and Khrushchev dolls, a rare souvenir of the Cuban Missile Crisis, frown or smile—depending which way you turn their heads—from atop the sideboard. Woody Woodpecker crops up everywhere—in posters, as a figurine, wristwatch, mug, back scratcher, clock, bubble bath container, light—you name it—and is beloved for what he represents: "He was created by an independent cartoon studio that stood up to Disney. He's an upstart," Basile says. Aurora's model monsters from the 1960s on display in the bedroom. Down the hall, one enters the Record Room, named for the 3,000 records that line the shelves—mostly rhythm and blues, jazz, American popular standards, ethnic music, rock and roll, and disco, including a collection of vinyl played at Studio 54, the famous late-1970s New York nightclub. 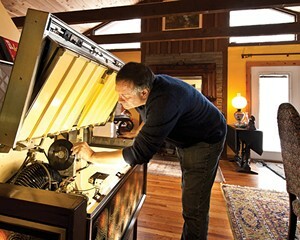 A Mr. Magoo doll sits atop the German-made Wurlitzer Princess jukebox. Two midcentury Danish chairs and an array of plastic vintage toys, including Mr. Machine, a Dadaist-style robot that was one of Basile's favorite childhood toys, complete the illusion you're traveled back in time to 1964. Fifteen metal lunch boxes are on display, each printed with personages from TV shows, including "The Munsters," "Land of the Giants," and "Fireball XL5." "The only plus in going back to school as a kid was a line of products like this," commented Basile. Among the obscure corporate personages is an early MacDonald's mascot named Hamburglar. The black-and-white-striped cloth felon so spooked kids it bombed as a marketing device—and was replaced by the relentlessly cheery Ronald MacDonald. Basile also collects classic cars and currently owns a black, white-topped 1973 Cadillac Eldorado. The immense, low-slung Caddy, which came out the same year as the oil embargo, was a cultural dead end, a stillborn vision of glamor relegated to the gas line. At Basile's place, the past comes to life, stirring up distant memories mixed with the irony of hindsight—futuristic visions that faded in a world of dwindling resources, exploding populations, and environmental crisis; obsolete gender models; and a pop culture of optimism and simple mechanics replaced by a darker, more cynical viewpoint and computer-generated simulations. Nonetheless, his objects of fascination strike unexpected chords of emotion. "Nostalgia hits a nerve," said Basile. "I have old friends all over the house. It should be entertaining to visitors, and hopefully they like the company."